New melons continue to be identified which have unique characteristics and are adapted to NC growing conditions. This provides commercial growers with additional choices such that they can grow and market some of these new program melons. One melon grown on a limited scale in 2004 with two growers was Sugar Nut. It produced good yields and high quality melons. In the future, there is potential for increased production acreage of Sugar Nut. The consumer is interested in having melons of high quality with unique flavors and textures. New melon cultivars are being developed each year and there are a range of specialty melon types. Interspecific crosses result in new melons that often do not fit neatly into a particular melon category. This may offer new production and market opportunities. Disease resistance is another important component of variety development and many of these unique melons have limited disease resistance or tolerance. It is important to realize that a unique cultivar with a special quality or characteristic can have a dramatic impact, resulting in the opportunity to produce a product that can be marketed and be profitable. The primary goal of the melon screening program is to assess advanced lines or new cultivars of the various melon types and to determine their adaptation to southeastern United States growing conditions (i.e. North Carolina). Another objective, which is equally important, is to take promising lines or cultivars of the various melon types and test market them for consumer acceptance. It is very important that markets are developed as production factors are being evaluated. Several reports have described tests that involved the evaluation of specialty melons, but it appears that there has been limited market penetration by these specialty products (Elmstrom and Maynard, 1992; Simon et al., 1993a, 1993b). A third objective of the melon evaluation program is to have grower participation in the market development. This is done through informal contacts during the season; through the use of advisory committees, and on-farm demonstrations and cooperation with county agents and farmers. Several on-farm demonstrations of specialty melons were conducted in 2004 (see specific reports for results). The most important end goal is to provide North Carolina farmers with a quality product they can grow which produces well, and can be successfully marketed for profit! Before the growing season, seed companies are contacted to obtain seeds for a variety of specialty melon types. Seed companies donate seeds in all cases as they are interested in their cultivar and product lines and how if they can be grown and produced in the southeastern United States, and if they have market potential. The primary melon type grown and marketed in North Carolina, and the United States is muskmelon. Thus, all other melon types (i.e. juan canary, ananas, charentais, Crenshaw, piel de sapo (Christmas), casaba, Japanese, etc.) are considered specialty types. This includes honeydew melons since these are not grown in any great quantity in North Carolina. Once all seed were obtained, they were sown in transplant trays 1 April 2004. Fertilizer (10-10-10) was broadcast and incorporated on 6 April 2004 at a rate of 400 pounds per acre prior to the laying 60-inch wide black polyethylene plastic (1.25 mil thick). The 8-mil drip tube with a 12-inch emitter spacing (0.45 gallon/minute/10 ft, T-Tape) was placed beneath the soil surface during fumigation. On 7 April 2004, methyl bromide was injected at the time the plastic was laid. The remaining nitrogen and potassium was fertigated weekly for the season. Total nitrogen applied was 142 pounds per acre and 305 pounds per acre potash. Transplants were treated with Kocide 101 two times before planting in the field. Approximately 4 weeks after seeding, the plants were established in the field (27 April 2004). Spacing between row middles was 5 feet and in-row spacing was 2 feet. Plot size was one row of 15 melon plants for the specialty melon observations. At time of transplant, a starter solution was applied using 20-20-20 (1 lb/50 gallons water) and Diazinon (3 oz/50 gallons water) for insect control. Insecticides and fungicides were applied weekly as a preventative measure beginning four weeks after transplanting (North Carolina Cooperative Extension Service, 2000-2004). Watering was reduced two weeks prior to harvest to improve fruit quality. Harvests were made Monday, Wednesday and Friday of each week for the melon screening study. Evaluations of each melon entry included yield, production earliness, average fruit size, soluble solids using a hand held refractometer (5 fruit samples), fruit shape and size, exterior and interior descriptions, flavor, flesh texture, disease susceptibility/tolerance and harvesting criteria (i.e. slip vs. does not slip). Based on this information, cultivars or advanced lines which showed potential for commercial production will be included in a screening or evaluation trial in 2005. Melon entries with obvious defects or no special features will not be evaluated in 2005. Several of the ananas melons show promise with some of the best ones being from Hollar Seed Company (i.e Duke and HSR 4220). As has been found in previous years, harvest time is critical with this type of melon because the shelf life is limited compared with most other melon types that have been tested. Researching and finding ways to extend shelf life or improve handling of this type of melon may make this melon type more suitable for commercial shipping. Until shelf life extension can be obtained and handling is improved, it will be difficult to include this melon type in shipping markets. Another melon type which is very tricky to grow is a Charentais melon. In 2003 and 2004, the HMX 9606 line was the most resistant Charentais melon to cracking of the four entries tested. This melon needs to be harvested at the ¾ slip stage to reduce the incidence of cracking. Growers might find some success in growing and selling Crenshaw melons for local markets. This melon is not well adapted for grocery store chain sales. Of the two we tested, Burpee’s Early was best. Shelf life of the Galia type melons is being improved though breeding efforts. It is not as good as a muskmelon, but generally better than an ananas melon. One of the melon cultivars that performed well in 2004 was Elario (Hazera Seed). It was one of the higher yielding of the Galia types with nearly 16,000 fruit being produced per acre. It also has a very attractive finish on the rind. The juan canary melon can be grown commercially in North Carolina. Several cultivars are well adapted; Sonora, an older cultivar, and Golden Beauty 229. Bartlett Hybrid produced over 10,000 fruit per acre in 2004, up 2,000 fruit from 2003 trials. Bartlett Hybrid received notice in 2003 for its pear-like flavor as its namesake suggests. It was tested for the first time in 2003 and produced well in 2004. The Christmas (piel del sapo) melons have been a challenge to grow in North Carolina due to their requirement for a longer time to ripen. Because of this, disease is more difficult to control over the longer period of time necessary to grow this type melon. The hot, humid growing conditions of North Carolina are conducive to increased disease versus dry, warm growing conditions. In spite of the challenge in growing the Christmas melons, Sancho did produce some wonderful tasting fruit which were rated very high at the Specialty Crops field day in July 2003 and 2004. The other four Christmas melon entries were inferior to Sancho because of less fruit quality and Ruidera and Daimiel being extremely susceptible to powdery mildew. Sugar Nut was placed on two commercial farms in 2004. The melon quality was extremely good with very sweet with excellent flavor. Favorable reviews of this melon were received from both growers in 2004. For the first time, a Hami melon was included in the specialty melon screening trials in 2004. These melons can have variable flesh color. The flesh is characterized by is crisp texture and sweetness. The melons can often be stored for several weeks. 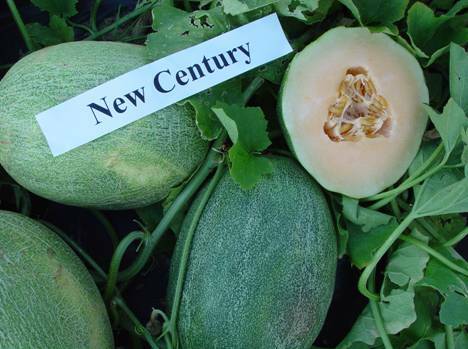 New Century was the Hami melon tested in 2004. It had a light orange flesh and produced reasonable quality fruits. Funding has become limited for the Specialty Crops program and the melon program will no longer be funded by this program in 2005. We are trying to secure funding in order to continue the melon screening program in 2005. Table 1. Specialty melon cultigen/line name, seed company, and fruit description. Cunningham Research Station, Kinston, N.C. 2004.
when ripe. They have a sweet, aromatic, soft white flesh. Ananas melons tend to be very perishable. no suture; harvest when abscission has begun to form but will not slip. matures. They slip when mature. They are aromatic, with green flesh and resist cracking under wet conditions. critical to prevent cracking. Determination of when to harvest is difficult in some cases. harvested when the abscission layer appears but prior to full slip. Juan Canary: These melons do not slip. They turn golden yellow when ripe. Oriental: Most of these melons are smaller melons and do not slip. They have crisp white flesh. Piel de Sapo (Christmas Melon, Santa Claus Melon): This melon is typified by the frog skin rind. It does not slip but develops diffuse netting at peak ripeness. This melon has white flesh. Hami melon: This ancient melon originated in the northwest China’s Xinjiang Uygur Autonomous Region. Hami melons may have either red-pink, orange, white or green flesh. The flesh is crisp and very sweet. These melons may be stored for several weeks to a few months with little quality loss. Miscellaneous: These melons do not fall in the other groups but have unique characteristics. 1Melons harvested 3 times per week, 15 plants per plot at 30 feet. 2Early harvest 1-4, June 22-28 (57, 58, 60 and 63) days after planting. 3Mid harvest 5-7, June 30-July 7 (65, 67, 70, and 72) days after planting. 4Late harvest 9-16, July 17-25 (74, 77, 79, and 81) days after planting. 5Solube Solids; reflects the sugar content of a fruit (average of 5 melons).